Racing against jets has become part of the super car tradition, with auto enthusiasts demanding more every time as manufacturers relish in the opportunity to showcase their vehicle’s capabilities. Well, last week, the Lamborghini Huracan was ready to take its turn against a Russian Su-30 jet. 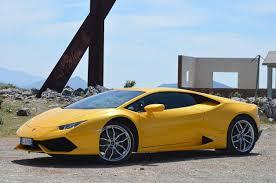 On paper, the Lamborghini Huracan is one of the fastest and most explosive cars in the world. In a recent test, the Huracan showcased an incredible 2.5 second 0-60 time, which is easily one of the fastest in the world. Car and Driver says of the car, “Its angular design manages to be both severe and elegant, and its stealth fighter-like cockpit is as luxurious as it is intense.” The car also features a 602-horsepower V-10 engine with a seven-speed dual clutch automated gearbox (No, there is no manual option in this vehicle). Its current asking price… $237,000. But could it accelerate the speed of a jet? Take a look at it here. This entry was posted in Video and tagged jet, lamborghini huracan, race, russia, su-30 jet. Bookmark the permalink.